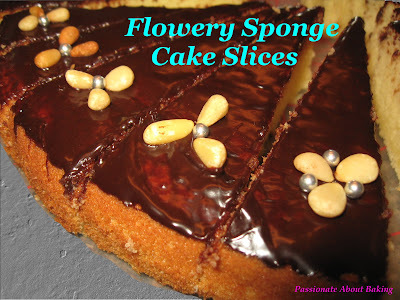 I'm still looking for a foolproof sponge cake which I can bake for any birthday cakes. So far, I've quite successfully baked Alex Goh's Sponge Cake, traditional sponge cake, and emulsifier cakes. The easiest cake to bake is the emulsifier cakes. They also stay soft for a long time. However, I tried to avoid baking that if possible as emulsifier is, afterall, a chemical. 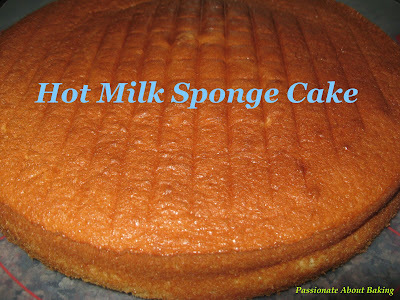 Today, I decided to bake "Hot Milk Sponge Cake" from The Cake Book. I read through this a couple of times, but each time, I ended up using other recipes. 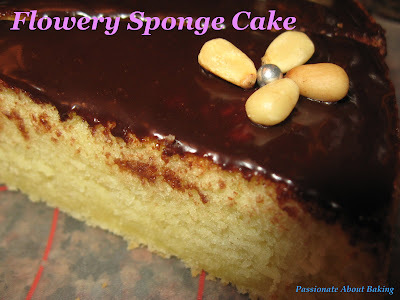 This cake is described as "gloriously moist and tender all-purpose sponge cake with a fine crumb and lovely golden colour." So here is my version. Recipe extracted from "The Cake Book" by Tish Boyle. 1. Sift together the cake flour, baking powder, and salt two times. Set aside. 2. In a small saucepan, combin the milk and buttr and heat over mediu heat just until the butter is melted. Remove the pan from the heat and set aside. 3. In the bowl of an electric mixer, using the whisk attachment, beat the eggs at high speed until blended, about 1 minute. Gradually add the sugar and vanilla extract and beat until pale and tripled in volume, about 6 minutes. 4. Sift one-third of the flour mixture over the egg mixture and gently fold it in with a rubber spatula. Repeat with the remaining flour mixture in two more additions. 5. Reheat the milk mixture to just under a boil. Add it all at once to the egg mixture and gently fold it in.Scrape the batter into a greased 9" cake pan. 6. Bake the cake at 180C for 20-25minutes, until it springs back when lightly touched and a cake tester inserted into the centre comes out clean. Cool the cake in the pan on the wire rack for 10 minutes. 7.Run a paring knife around the edge of the pan and invert the cake onto the wire rack. Reinvert the cake so that it is right side up, and cool completely. Oh really? How come yours looked so much nicer than mine? I think I would have over-folded my flour again. :( I'm always very lousy at folding flours to eggs. I've not acquired that kind of skills yet. :( But like you said, after the hot milk was poured into the batter, it was really smooth and nice yah? ;) Can teach me how to fold? I can't see any discernable difference between your cake and mine :) I usually just fold it in only until there are no streaks of flour in the batter. Was your batter still pretty 'airy' after folding both the flour and the hot milk mixture in? My batter was very thick, very difficult to fold at the flour stage. But after the milk stage, it became smoother. So I think I would have over folded the flour and broke the bubbles. For me, there are always flour that sank to the bottom of the bowl. So it took me really long to fold the flour, that was why I always broke the bubbles. :( My cake was not "moist & soft" as what it was to be. Pretty cake you had there! I'm so admire you've got the passion in baking. am i able to take a motor insurance company to small claims court? The insurer supplier refused my claim, (I would take the at fault driver to small claims sadly I've no address to serve them or send a requirement letter). One another driver was at fault but his insurance provider says there can be a difference with our claims so they really have to take the word of their insured vs. my word. I believe they acted in poor trust and did not execute a proper investigation would this be described as a valid claim in small claims court? I would like to grab the to blame drivers insurance company (not my own) to small claims for any damages to my car.